"Some people ask: 'Why the word feminist? Why not just say you are a believer in human rights, or something like that?' Because that would be dishonest. Feminism is, of course, part of human rights in general—but to choose to use the vague expression human rights is to deny the specific and particular problem of gender. It would be a way of pretending that it was not women who have, for centuries, been excluded. It would be a way of denying that the problem of gender targets women." In just under fifty pages, Nigerian writer Chimamanda Ngozi Adichie makes a sharp argument as to why we should all be feminists (as if we weren't already believers). Based on a Tedx talk Adichie presented, this nonfiction account follows Adichie from childhood up to the present as she recounts the first time she heard the word "feminist," what the word really means, why both genders should be treated equally, and how this belief has changed her life. 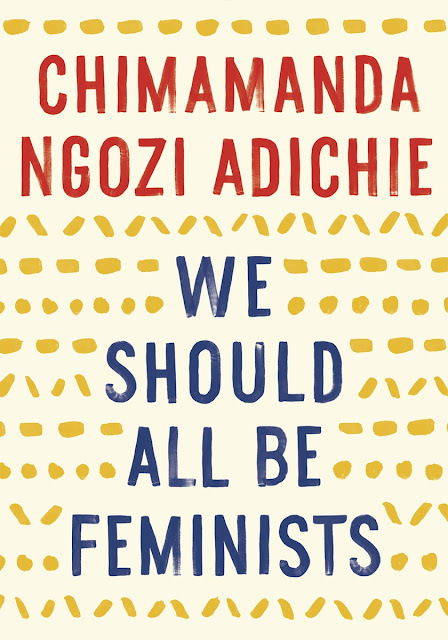 Consequently, thinking about equality has been a profound focus of Adichie's time ever since. "We spend too much time teaching girls to worry about what boys think of them. But the reverse is not the case. We don’t teach boys to care about being likable. We spend too much time telling girls that they cannot be angry or aggressive or tough, which is bad enough, but then we turn around and either praise or excuse men for the same reasons. All over the world, there are so many magazine articles and books telling women what to do, how to be and not to be, in order to attract or please men. There are far fewer guides for men about pleasing women." "A woman at a certain age who is unmarried, our society teaches her to see it as a deep personal failure. And a man, after a certain age isn’t married, we just think he hasn’t come around to making his pick." "And then we do a much greater disservice to girls, because we raise them to cater to the fragile egos of males. We teach girls to shrink themselves, to make themselves smaller. We say to girls: You can have ambition, but not too much. You should aim to be successful but not too successful, otherwise you will threaten the man. If you are the breadwinner in your relationship with a man, pretend that you are not, especially in public, otherwise you will emasculate him." The book is short, clear, and despite its brevity is full of many quote-worthy lines. If you're still afraid of the term "feminist," please read this book so you can come to understand that fighting for gender equality should never be considered a bad word. "I have chosen to no longer be apologetic for my femaleness and my femininity. And I want to be respected in all of my femaleness because I deserve to be." I liked the brevity: I think it appeals to those who might be wary of reading about this topic and I hope it motivates them to pick it up! I loved this book too. Have you read any of her fiction? I read Americanah last year and really enjoyed it.